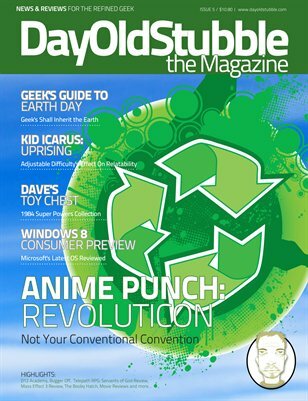 In our April issue we go a little green with some great tips us geeks can use to help save Earth on p16. James is back with another great convention round-up on p28. We also feature a new guest writer, Chalkey Horenstein, who breaks down the effects of adjustable difficulty in the new Kid Icarus: Uprising on p32. Shea is back with another great DVD on p40, "Battle Royale," a japanese film where junior high students are sent to an island to battle to the death, just in time for the release of "Hunger Games". Aaron's D12 Academy sheds some new light on Axis & Allies 1942 on p24. Dave Norton brings us two new sections, Dave's Toy Chest on p20 and Wrestling Geek on p45. In Dave's Toy Chest he takes a look at the 1984 Kenner Super Powers Collection and in his Wrestling Geek he discusses Wrestlemania XXVIII. We also take a look at the New iPad, review Ubuntu 12.04 LTS is reviewed and we finish our look at the Windows 8 Consumer Preview. All this plus much more inside the April issue.